Bali is a real paradise for food. With Indonesian, Vietnamese, Chinese, Japonese, Malay and Philipinean ingredients, taking cooking lessons in Bali is discovering the south east Asia in one go! 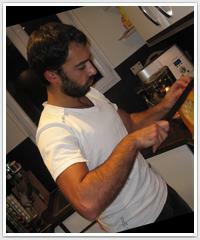 The cook was born in Beirut, and became a chef in Paris, France. He is now teaching with ease, a cuisine that's inspired by flavors from around the world! 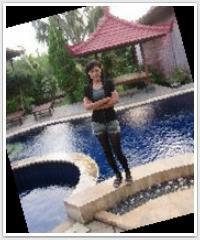 Our school is located in the north of Bali. Our restaurant is part of our guesthouse, so you have the opportunity of staying at our place also. We offer a unique opportunity to learn Sumatran and Balinese style of cooking in Bali. The class starts in the morning with a trip to the local market to buy fresh produce. You can choose up to three dishes to make from our restaurant menu. The classes are hands on as we believe you can only learn by doing. One of most popular dishes to make is rendang. A spicy curry cooked in fresh coconut milk from Sumatra. 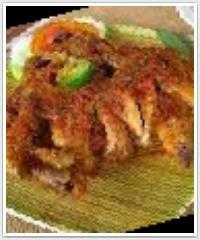 Ikan pepes or fish cooked in banana leaves is also very popular. We have a BBQ complete with rotisserie, which is perfect for cooking Ayam Betutu or roast chicken cooked in Balinese spices and wrapped in banana leaves. The class includes a free recipe book which you can learn to cook all the dishes from our restaurant. Once you have made the dishes, you can enjoy eating them for lunch in our restaurant which overlooks a rice paddy.